The Omni can find schools of fish faster—the quicker a catch is located the sooner speed can be reduced. The Omni can approximate size/weight so that larger schools can be selected and smaller schools bypassed. It will allow a fisherman to select small schools of fish and track them so that multiple small schools can be combined in one drop of the net to maximize the catch size. This means reducing fuel costs and running time. With the Omni sonar, it is possible to see the front, back, sides, and height of the school of fish to be caught. 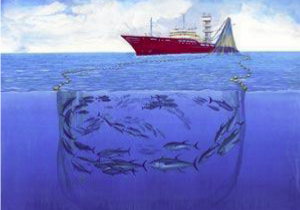 If the school is too large for a single net, Omni sonar allows the fisherman to first see that it is too large, and then allows him to fish only the back of the school reducing the chances of killing the balance of the school. Based on signal strength and relative positioning of the fish school, it is possible for a fisherman to find only the species he is fishing. This means less by-catch and a more productive fishery. Outside of the hoist used to lower the sonar, the MAQ Omni sonar has no other moving parts, and with some of the vessels having had the same sonar for up to 20 years. The Omni sonar is designed to find fish in shallow waters. With our 5° vertical beam, detection distance is 20 times the depth on soft bottom and 10 times the depth on hard (rocky) bottom. The 5° Vertical Beam allows for the best “near surface species” performance as well as superior near bottom shallow water detection. Why a Sonar at all? Less fuel used, less by-catch, less damage to the fishery, less time on sea, fewer hours for crew equals less chance for injury. Making money is and will always be about decreasing costs while increasing performance.